At the end of June, I wrote a post called Uninformed Outrage: Reacting Without Reading in which I noted that I have seen an increase in the number of people attempting to interact with my content on social media without reading it. I mentioned that I'm not the only one to have noticed this and referred to two other atheist bloggers who had reported similar experiences. In a comment on that post, 1HappyHeathen suggested I test it out by pairing an inflammatory title with an off topic post. I wish I could pretend that what I am about to describe was this sort of intentional test, but I just obtained some more evidence of what I was referring to. I posted this at Revolutionary Atheist (Tumblr). Underneath the image, I wrote, "I have to disagree with this meme about there being 'no difference;' however, the point is still one worth making." When I tweeted this post, I received several outraged responses. I could not help noticing that most had one thing in common: they were written by people who evidently never bothered to read the post. They had decided that my position was reflected by the image. Had they bothered to click on the link contained in the tweet, they would have known better. But of course, they didn't. How dare I make such an assumption! How do I know they didn't read the post? Actually, I'm not just guessing here. A few of those I responded to admitted that they hadn't read the post and were reacting only to the image. A couple were even apologetic about it. What this suggests to me is that many people do not bother to read what is posted and react (often with outrage) to either the title or the associated image. Part of me wants to attribute this to a disturbing level of laziness, but I suspect this would be unfair. My guess is that this is more about our attraction to outrage than anything else. I am beginning to suspect that many people use social media primarily because it provides them with a safe opportunity to yell at strangers. 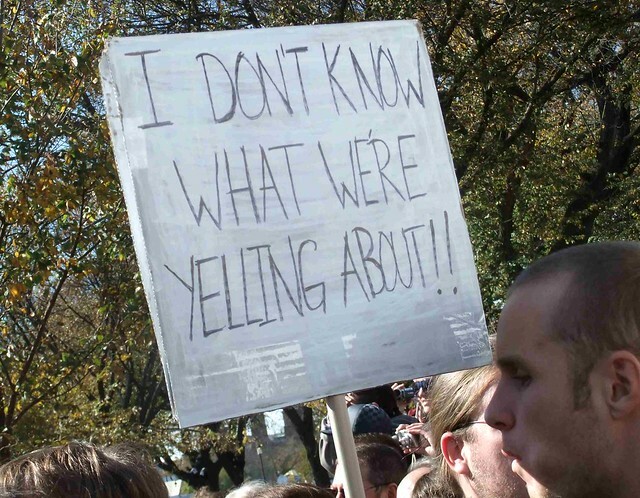 If this is correct, then it probably doesn't matter to them whether they know why they are yelling. It seems like there might be a lesson for bloggers in here somewhere, but I'm not sure what it is. Should we use misleading titles or controversial images to inflame outrage in order to get attention even though they have nothing to do with our content? Probably not. The outraged aren't bothering to read our content anyway. Maybe a better lesson is to recognize that a significant portion of our intended audience never makes it past the title and/or image.